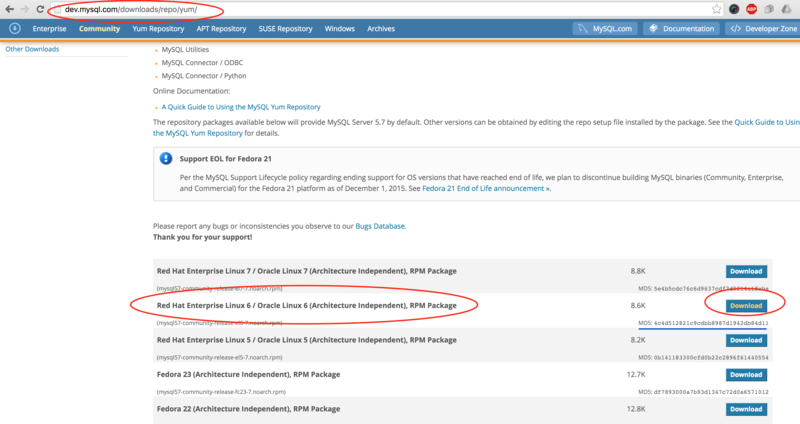 This post should help you to understand how to Install MySQL 5.6 on Ubuntu 13.10 x64 / Debian Linux. As I always say, its very simple process to install it. First head over to MySQL Downloads page and get the 64 bit Debian package for MySQL. Current version out there for general available release is [Note this may change as and when they release minors, so pick what ever is latest from this site at the time of your installation and modify the commands according to your filename]: mysql-5.6.15-debian6.0-x86_64.deb. Make sure you select Debian Linux from the select platform drop down. Make a note of the md5sum to verify that its legit file after we download it. In our case its 409a79231afb46473f8280a108c9dfdd which is right below download button as shown in the picture below. This post describes how to run multiple PostgreSQL 9.2 Instances on one server in CentOS 6/RHEL 6/Fedora flavors. I am assuming that you have a running postgresql engine on the server already. If not check this post on how to install postgresql server that I wrote earlier and install the first/main instance. Now that you have a running database engine(I will call it first instance) you can start slicing second instance on the same server. As most of my posts I will divide this post into multiple steps for easier understanding and implementation. 1. Create a new data directory [/var/lib/mysql2] and make mysql user own it. This post explains how to setup replication with Postgres 9.2 on CentOS 6/Redhat EL6/Fedora in Master slave configuration. This is also often called as streaming replication. Before you dig into this topic more, I would suggest going through my other post of implementing point in time recovery (PITR) using postgres 9.2. I am assuming that you have at-least two PostgreSQL 9.2 servers for establishing replication between those two database servers. If you don’t have experience installing PostgreSQL 9.2 on CentOS or Redhat please read my other blog post here on how to install PostgreSQL 9.2 server and get it up and running in no time. First we need to work on master database server and we will eventually move on to slave server configuration.